The highest dwell/exposure time ultraviolet sterilizer/clarifier. The BEST construction in a market flooded with low quality units. For pond green water control & disease control. Including large ponds UVs. For aquariums, capable of Level 1 and 2 Sterilization. Quartz sleeve, sturdy construction, excellent parts availability. HO (high output) straight tube professional UV sterilizers with maximum mW/cm2 UVC exposure. 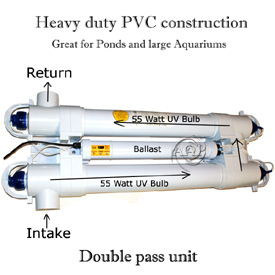 The Tropic Marine Centre Pond & Aquarium TRUE UV Sterilizers feature solid construction. Built by a company long recognized as a industry leaders in its innovation and quality of products. THESE CATEGORY 'A' STERILIZERS HAVE THE HIGHEST DWELL TIME OF ANY COMPARABLE BRAND UV STERILIZER! As well, these UV Clarifiers are built with low pressure, high output UV-C bulbs, which has maximize water contact/dwell time. Unlike many comparable high priced units. North Americas Largest Seller of TMC UVs! 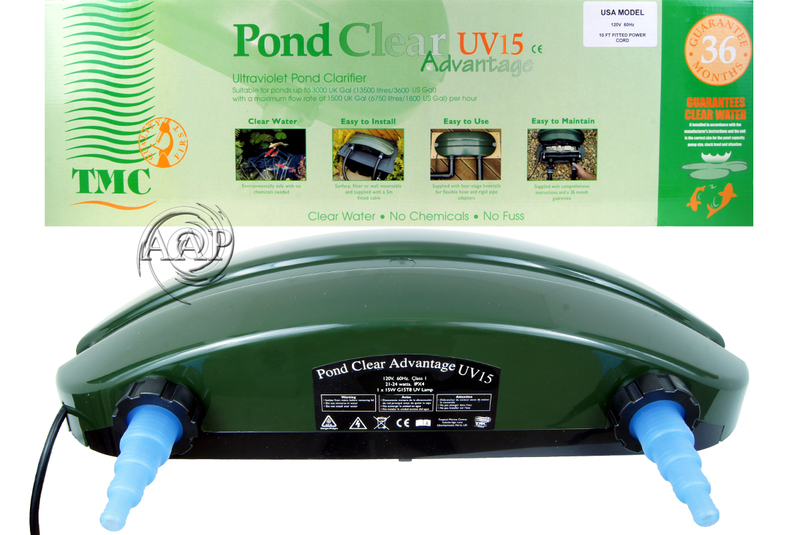 Many pond UV Clarifier/Sterilizers currently on the market come with high price tags for features such as “wipers”, which do little to improve UV Sterilization (& often break quickly). When one considers a UV should be serviced every six months in the first place (wipers do little for the main problem that needs servicing; calcium buildup). As well, ALL models of TMC UVs are quite simple to change the UV Lamp. In most cases, the housing opens with the removal of a three screws and the bulb easily slide out of the quartz sleeve. The Vecton aquarium UV has a more compact design than the otherwise same dwell, flow design of the Advantage, with opposite return/outflow specifically for aquariums. 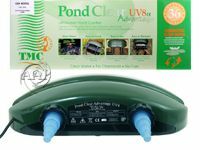 The Advantage can be used either for pond or aquarium. 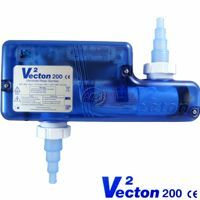 We recommend the Vecton primarily for aquarium use. 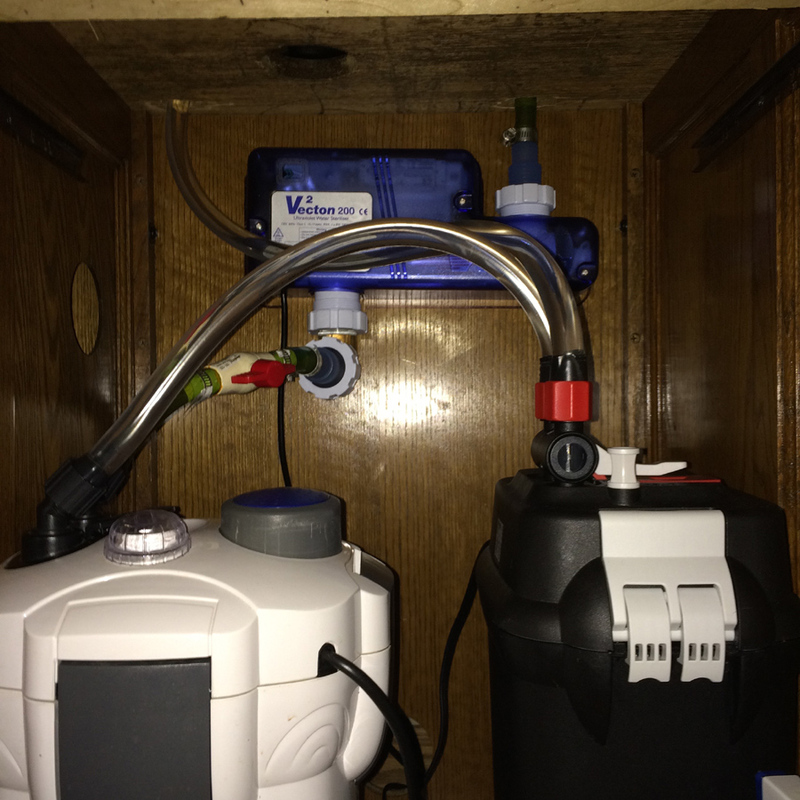 The picture to the right displays a Vecton 200 8 Watt UV mounted to a canister filter combination. 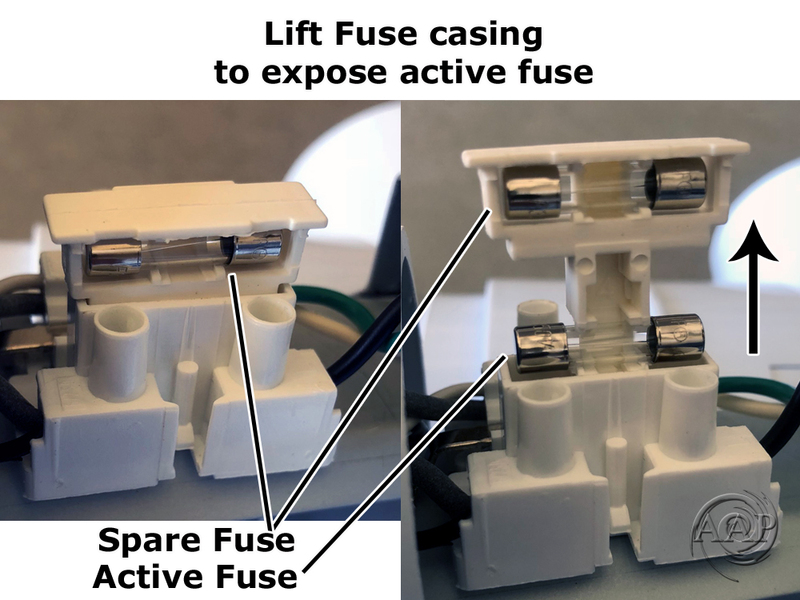 Both the Vecton and Advantage are vastly easier to service than most popular Compact UV Sterilizers (including ones we sell), with the results being much less chance of a broken quartz sleeves during service of the UV. 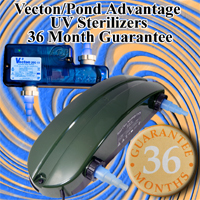 Both the Vecton & Pond Advantage UV Sterilizer/Clarifier are superior to ALL popular compact UV Sterilizer/Clarifiers sold today (including those we sell). As well, there's no comparison between the TMC True UV Sterilizer/Clarifier, the popular Internal/Submersible, and especially the Hang On UVs which AT BEST are clarifiers, NOT level 1 or higher UV sterilizers.. These TMC UVs provide long exposure/high dwell time per wattage of UVC irradiation (again unlike many of the HO UVs, which have inadequate exposure time as per wattage of UVC). The Result is that all the TMC UVs can handle flow rates 5-20 gph per watt more than most other UV Sterilizer/Clarifier to perform the same level. (Clarification, Level 1, & Level 2). As an example, the TMC 8 Watt Vecton will outperform ANY 13 watt compact UV sterilizer due to vastly superior dwell time time! The TMC 8 Watt Vecton produces 2.08 watts of UVC energy per second while the best Compact 13 watt UV produces 1.95 watts of UVC energy per second! Quite bluntly, there's no better UV Sterilizer/Clarifier watt per watt than the TMC UV Sterilizer/Clarifier at any price. Then when one considers these AAP Vecton/Advantage UVs will last a decade or more with regular maintenance compared to a few years for the average Chinese built UV (even the better ones), the cost long term is generally less!!! Finally, please note, while our suggested aquarium/pond sizes; as well as recommended flow rates, may seem lower than most other web sites UV Sterilizers/Clarifiers. Even what the manufacturer writes on the box. This is because we publish tested, proven flow rate, and aquarium/pond size suggestions based on our 30 years experience. Not best case scenario or even impossible flow rates. As well, recommended aquarium or pond sizes are ONLY a guide and our recommendation often varies from the manufacturer since water turnover and flow rates are much more important! Know that when you purchase a UV Sterilizer/Clarifier from us whether the TMC, Terminator, or others, which recommendations are based off real world experience and facts not manufacturer claims based on perfect conditions that due not exist in an aquarium or pond. The new Vecton UV sterilizers by Tropic Marine Center offers a new easy and convenient way to utilize the benefits of Ultraviolet Sterilization on smaller aquarium systems. The new design is lightweight and easily attaches to a wall or cabinetry. New design. Manufactured from impact resistant translucent polycarbonate. 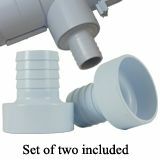 NEW 90 degree adapter elbow (1) for difficult plumbing situations. 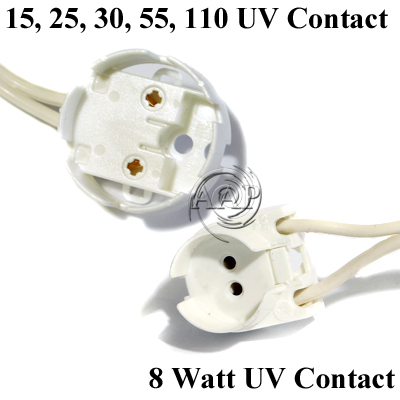 2-3 Year warranty (six months UV-C Bulb/Lamp & Starters, two years ballast). Also includes (2) standard hose barb attachments. Highest Output low pressure UV Lamps by Phillips (please note these Phillips lamps usually have solder "balls" rolling around and this is perfectly normal). Four stage hose tails for flexible hose from 1/2" to 1 1/4". Held in place with screw on collars for easy removal when servicing and maintaining unit. Compact, rigid pipe adaptors, for connection to 32 mm, 40 mm or 1" rigid pipe, are available. 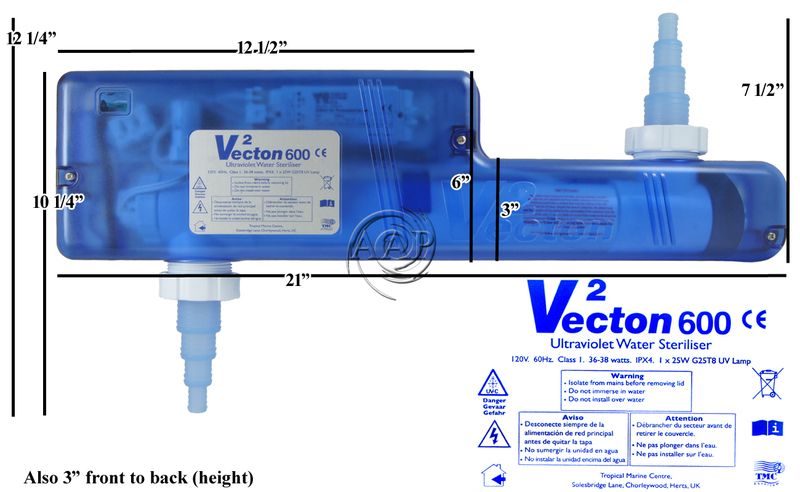 While designed for aquarium use, for those desiring higher sterilization properties, the "in case" IP65 ballast design of the Vecton is perfectly safe for pond use assuming it is covered to protect from direct moisture. Max flow rate for level one Sterilization. 280 gph (maximum effectiveness- 35 gph/ 132 lph PER WATT). Size- 13” L x 3” H x 5” W.
Recommended vinyl tubing size- 1/2", 5/8", 3/4", 1", or 1.25" ID. Rated for up to a 60-100 gallon (378 liter) aquarium* for optimum level one effectiveness (smaller for level two), based on a water turnover rate of 1.5 times per hour or more through the Vecton UV at the recommended flow rate. For replacement 8 Watt T5 2 Pin Bulb (supplied with UV). Currently Out of Stock as per 2014 USA Dept. of Energy Regulation on Magnetic Ballasts. A new ballast has been in testing by TMC but no time-line has been provided as TMC desires these new ballasts hold up to their durability standards unlike most that use cheap Chinese ballasts. Also consider our the Vecton 600 25 Watt which has past this rigorous testing and works for 99% of the aquariums the model 400 and performs even higher levels of UV Sterilization (both are the same size unit too)! Max flow rate for level one Sterilization. 525 gph (maximum effectiveness- 35 gph/ 113 lph PER WATT). Size- 21” L x 3” H x 6” W.
Rated for up to a 110-300 gallon (1135 liter) aquarium* for optimum level one effectiveness (smaller for level two), based on a water turnover rate of 1.5 times per hour or more through the Vecton UV at the recommended flow rate. Max flow rate for level one Sterilization. 750 gph (maximum effectiveness- 30 gph/ 114 lph PER WATT). Minimum flow 50-75 gph to prevent over heating. Rated for up to a 180- 500 gallon (1892 liter) aquarium* for optimum level one effectiveness (smaller for level two), based on a water turnover rate of 1.5 times per hour or more through the Vecton UV at the recommended flow rate. For replacement 15/25 Watt T8 2 Pin Bulb (supplied with UV). *Please READ these Flow Calculations for how we arrive at our flow and aquarium size calculations. We go by these calculations NOT what any manufacture claims on their box! In the case of TMC and many other manufactures, they tend to over rate their UV clarification abilities. While for Sterilization, TMC in particular tends to rate the tank size per Vecton UV for level two Sterilization (albeit a little high here as well), NOT level one! On most UVs these numbers which, while not perfect, and assume a few parameters such as low water turbidity and proper spacing between lamp/sleeve and inside wall of the UV, has proven over the years to be highly accurate for the author of the above cited article (Carl Strohmeyer). For us to change this formula to fit certain manufacturer sizing recommendations as some have asked would be highly dishonest for us to do. Flow rates are based on actual flow rates after Head Pressure is factored in. 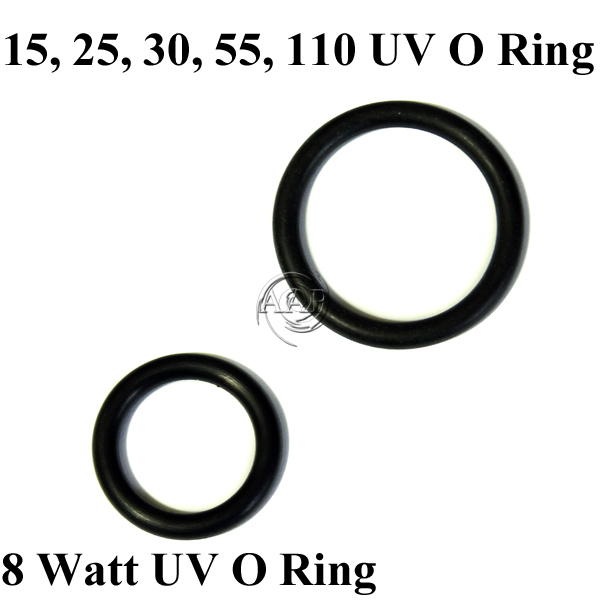 The same UV lamp & similar internal design as the 15 & 25 Watt Pond Advantage. 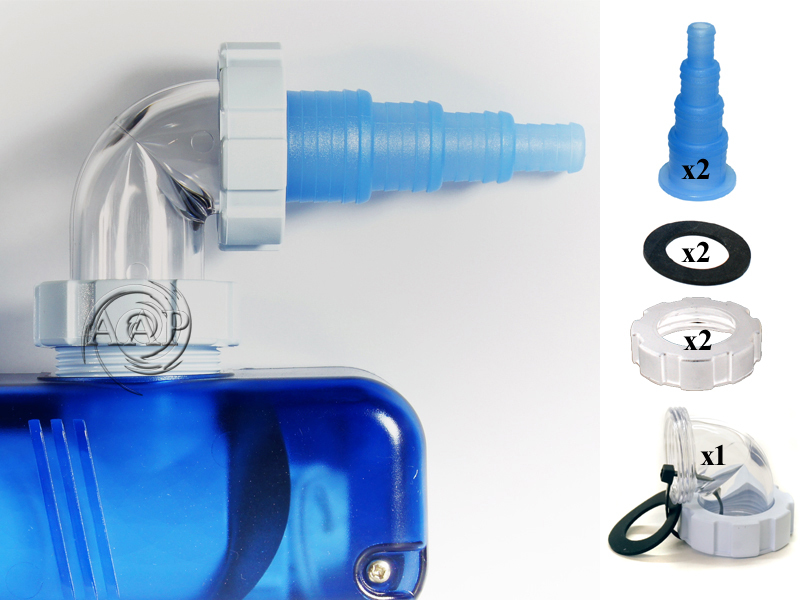 The Vecton's aquarium friendly design makes for easier mounting closer to the base of the aquarium, thus allowing canister filters or internal pumps with poor head pressure a better flow rate for otherwise marginal pumps/filters. The same basic design as the TMC V2 Vecton UV8, UV15 & UV25. Also made by Tropic Marine Center, except with a more weather resistant/durable "shell", making this a more weather resitant UV than its "sister" UV. As well, the 8/15/25 Watt Pond Advantage hold a larger water volume capacity for better clarification dwell time properties, although slightly lower Sterilization properties for a given flow rate as well as aquarium size than the Vecton (the Vecton can be used in Pond Applications too, and in fact it does have better sterilization properties, but it should be placed in an enclosure near the pond to better protect from weather/sprinklers). Excellent for Hydroponics applications along with the UV30 and UV110 further below on this web page. UV8- Rated for ponds UP TO 1200 gallons (low bio-load/sunlight factor, 1/2 this size high) with a rated maximum flow rate of 720 gallons per hour. However, we recommend a maximum of 520 gph (after head pressure is figured) based on optimum flow calculations (60-65 gph per watt). As well, this UV for a maximum pond size of 1200 gallons based on a minimum turnover rate of once per three hours or less. With a more efficient flow design than ANY popular Compact UV Clarifier. UV15- Rated for ponds UP TO 3600 gallons (low bio-load/sunlight factor, 1/2 this size high) with a rated maximum flow rate of 1800 gallons per hour. However, we recommend a maximum of 975 gph (after head pressure is figured) based on optimum flow calculations (60-65 gph per watt). As well, this UV for a maximum pond size of 2250 gallons based on a minimum turnover rate of once per three hours or less. UV25 - Rated for ponds UP TO 4800 Gallons (low bio-load/sunlight factor, 1/2 this size high) with a rated maximum flow rate of 2400 Gallons per hour. However, we recommend a maximum of 1500 gph (after Head Pressure is figured) based on optimum flow calculations (60-65 gph per watt), as well I would recommend this UV for a maximum pond size of 3750 gallons based on a minimum turnover rate of once per three hours or less. 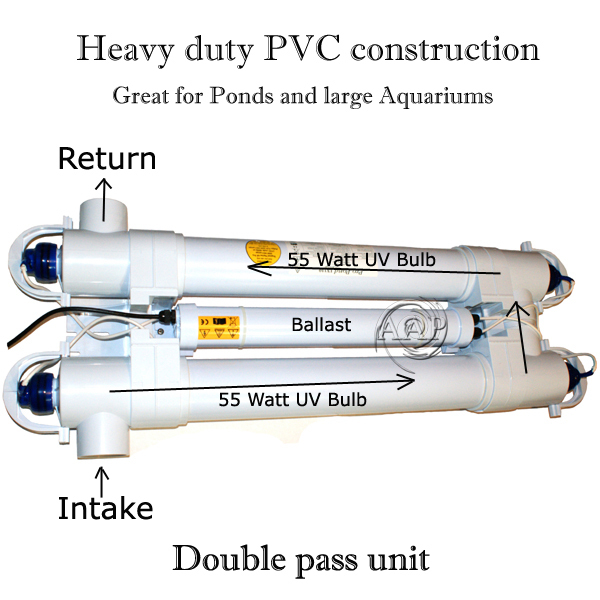 As well, the 25 watt can used for larger yet Ponds by utilizing 2 or more. For example two 25 Watt TMC Clarifiers can handle a 7000-9000 gallon pond. This is most efficiently performed by utilizing separate intake and returns for optimum pond flow circulation patterns or by splitting the return of for example a 3000 gph pump into two returns each with a 25 Watt Advantage UV. With a more efficient flow design than ANY popular Compact UV Sterilizer. The same basic design as the Vecton 25, Vecton 15, & Vecton 8 except a more durable case and higher flow design. 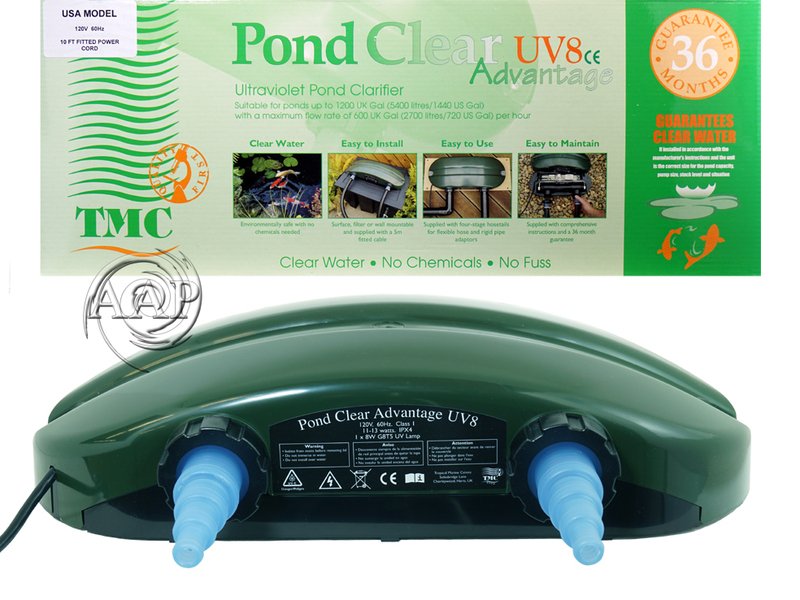 As well, these Pond Advantage UVs can be used for aquariums where a high flow, high end professional UV sterilizer is preferred. 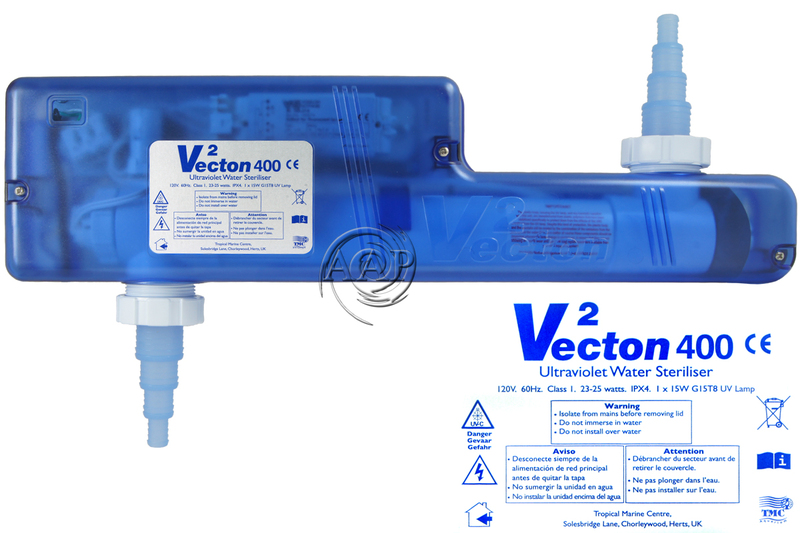 This is a PREMIUM UV Sterilizer/Clarifier equal to many other premium UVs such as Aqua or Emperor, except not a premium price. Watt per watt, more efficient than ANY compact UV Sterilizer (EVEN the Terminator we sell and even more so ANY sold on Amazon or eBay or other discounters). Robust construction and new ergonomic, green and black design. 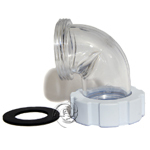 Surface, filter, or wall mountable and supplied with a wall mounting kit and a filter lid fixing kit. Four-stage hose tails designed to take flexible hose from 1/2" to 1 1/4". Hose tails are held in place with screw on collars, allowing the disconnection of the hose, leaving the unit or the hose in situ for ease of servicing and maintenance. 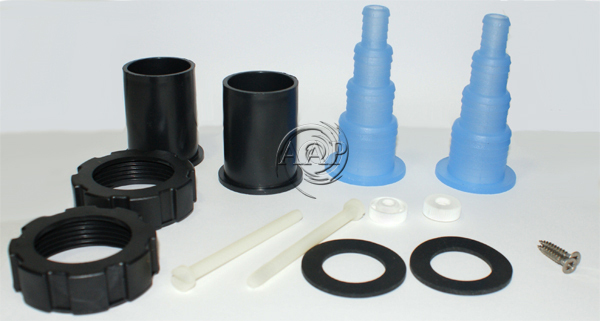 Rigid pipe adaptors, for connection to 1 inch (40 mm) solvent weld rigid PVC pipe, are included with the unit. 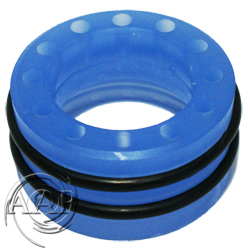 These adaptors are held in place with screw on collars, allowing the disconnection of the rigid pipe, leaving the unit or the rigid pipe in site for ease of servicing and maintenance. 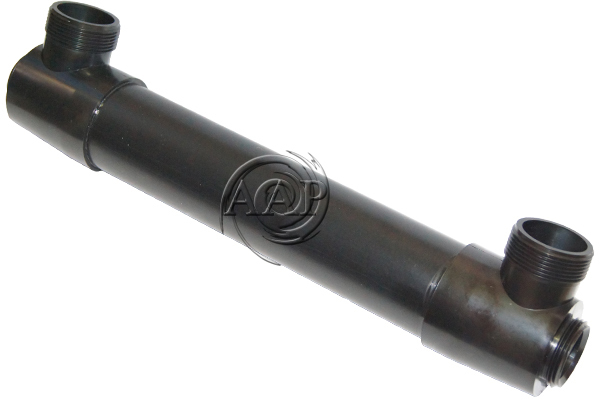 Additional Hose Barb Adapter are sold HERE to help with fitting 1.5" Hoses or other problem fittings. Easy access to working parts making maintenance quick and easy. Supplied with a 9 foot power cable. Complete with comprehensive instructions and backed up with full technical support from TMC. Full 36 month guarantee against any defect or failure. This covers all parts and labor. Super High UVC-C Dwell Time based on 35" of UVC Lamp Exposure @ 30 watts. No UV Sterilizer at ANY price has a higher dwell time as well as UVC exposure watt per watt of input energy, generally out performing 40 & 50 Watt UVs using much shorter lower dwell time T5 UV lamps! UV30- Rated for ponds UP TO 7100 Gallons (low bio-load/sunlight factor, 1/2 this size high) with a rated maximum flow rate of 3560 Gallons per hour. However we recommend a maximum of 2100 gph flow (after head pressure is figured) based on optimum flow calculations (70 gph per watt), as well I would recommend this UV for a maximum pond size of 6000 gallons based on a minimum turnover rate of once per three hours or less. Robust construction and new ergonomic, green, blue, and black design. Surface or wall mountable, and supplied with a wall mounting kit and a filter lid fixing kit. Transparent end caps make it easy to determine if the UV lamp is on. Easy lamp/quartz sleeve changes/cleaning. 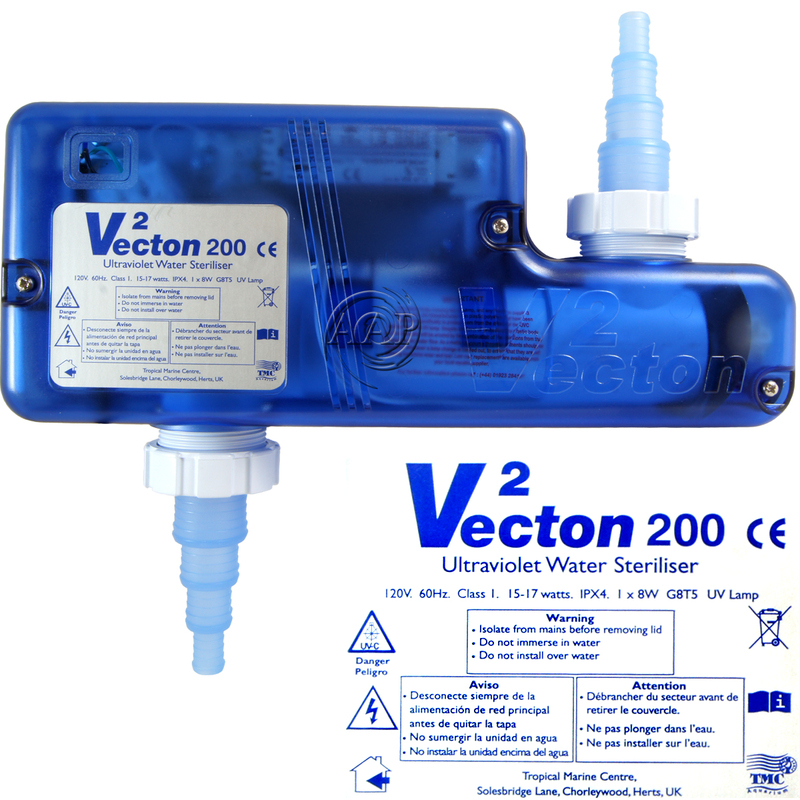 The is NO BETTER UV Sterilizer/Clarifier in its class at ANY PRICE! Compares favorably to the Aqua 114 UV with higher dwell time for the AAP/TMC! Only available in the lower 48 USA via UPS (no PO box) due to shipping issues and expenses elsewhere. 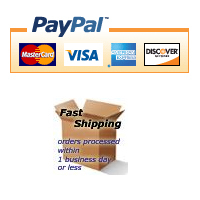 Please contact us for special shipping to other locations. Standard Shipping recommended, otherwise if default Economy or Postal Shipping is chosen, there is is no shipping guarantee (buyer then assumes responsibility for any shipping damage with Economy or Postal International). Designed for large ponds, hydroponics systems, or aquarium systems, such as those incorporating pressure filters, pressure circuits, sand filters, and venturis. 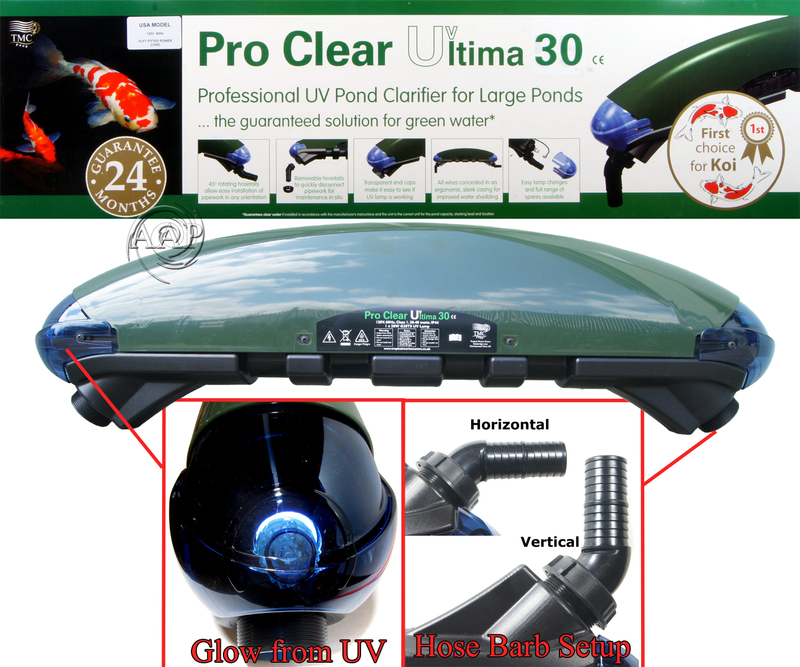 In fact, this TMC 110 PRO UV is superior or at the very least equal to other UVs in efficiency/effectiveness that are designed for large ponds or aquariums (systems) that often cost vastly more $$! As an example, this AAP 110 PRO UV has a higher dwell time than a popular 114 watt UV sold elsewhere & is thus more effective based on the science of dwell time numbers. This is the UV sterilizer Carl Strohmeyer, the author of many professional pond/aquarium articles has personally used in multiple applications and highly recommends! Since this is a PROFESSIONAL heavy duty professional model UV sterilizer, we also recommend that it to be hard plumbed either via 2" or Metric 63 mm PVC this can also be stepped down to 1.5" pvc after the connection (this hard plumbed method with a quick disconnect is preferred from Carl's extensive experience). The use of 1.5" heavy duty flexible tubing using the supplied 1.5" hose barbs is another option. If you are not reasonably handy with such installations, hiring a professional might be necessary (as it's impossible for our staff to be able to help with a unique installation). Please consider this prior to purchase. The TMC 110 PRO UV Sterilizer/Clarifier now includes two 1.5 inch hose barbs for more simple vinyl tubing installations, these fit and GLUE (with PVC Cement) inside the inlet/outlet ports. 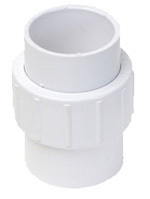 Please note that the SAE (2) inch pvc fitting is in the inner part of the inlet/outlet ports while the Metric 63 mm pvc fitting is in the outer part of the inlet/outlet ports. This is to allow for universal fitting in both USA & Canada (as well as the rest of the world). 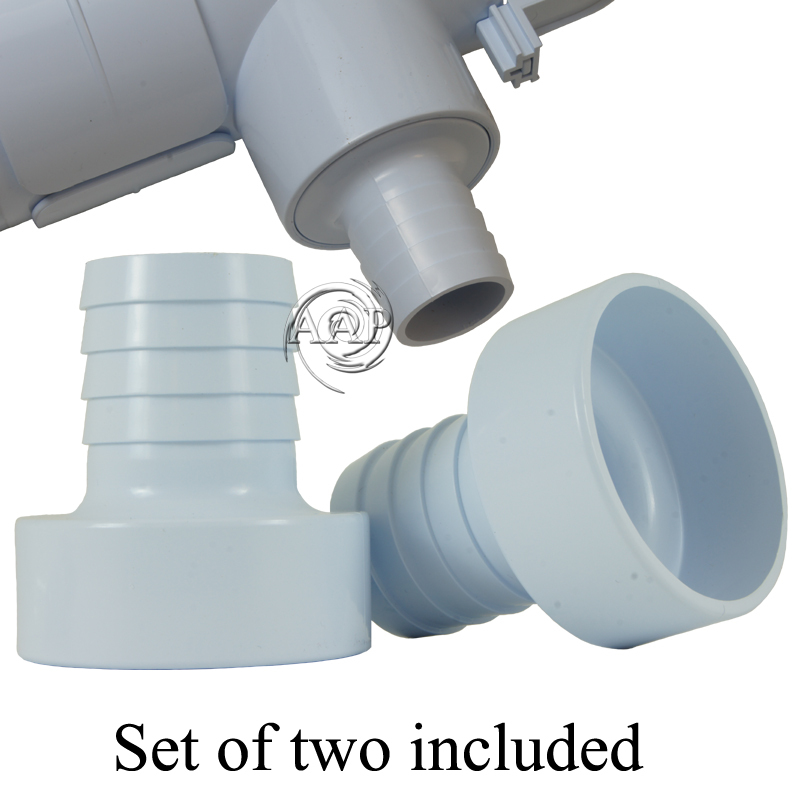 As well, the use of PVC pipe in these fittings is required for best results. Another suggestion is to utilize a (2) inch union for easy disconnect such as the slip by slip union pictured to the right (a threaded union can also be utilized). Not included- sold at plumbing supply stores. This is especially helpful in hard-plumb applications, although the use of the hose barbs makes this suggestion less necessary in our opinion. Suitable for ponds UP TO 19,200 gallons for clarification (low bio-load/sunlight factor, 1/2 this size for high). This is dependent on stocking density and the amount of sunlight the pond is subject to. A max flow rate of 9,600 gallons per hour (we recommend under 6,600 gph for best results). Suitable for ponds, aquariums, or aquarium systems up to 3300 gallons for level one or even level two sterilization (dependent on other factors such as turnover, stocking, etc.) with a suggested max flow rate of 3300 gallons per hour. *Please READ these Flow Calculations for how we arrive at these numbers. Fused quartz glass sleeves which ensure that germicidal lamps are able to reach their optimum 'burn temperature' where the highest amount of UVC radiation is emitted. 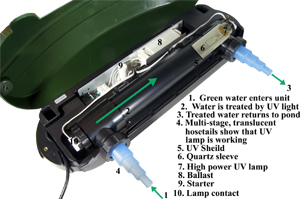 Also facilitates simple lamp replacement by keeping lamp separate from the pond water. UV Sterilizer Maintenance; Quartz Sleeve, etc. Useful for adapting different size hose barbs, such as the 3/4" inch hose barbs on UVs or other aquarium equipment to the 1/2 to 5/8" hoses common Ehiem and other filters, as well as many pond filters with 1.5" barbs to 1.25" barbs such as on the TMC 15 & 25 Watt Advantage UVs.